Dealing with a loved one’s alcohol addiction can be a difficult, long-term endeavor. Friends and family must learn to cope with fears that the addicted person will suffer physical issues, hurt themselves in various ways, encounter legal complications, have unpredictable mood swings, lie, and possibly even die, all related to using drugs and alcohol. According to the Centers for Disease Control and Prevention (CDC), about 53% of the population uses or abuses alcohol.1 With so many people abusing alcohol, it’s not hard to imagine the enormous number of family members, friends, and other loved ones who are, in turn, directly affected by problematic drinking. In some cases, family members of those who abuse alcohol may attempt to exert some external control on the person’s addiction (or the consequences of the addiction) by hiding or throwing away bottles of alcohol and taking away car keys. Other loved ones of an alcoholic may unintentionally enable the person by calling in to work for them when they are either still too drunk or too hungover the next day to show up, or by lying to other family members saying the person has the flu to deflect concern rather than acknowledging the drinking behavior and its obvious consequences. Support groups can be an invaluable tool for those family members who are struggling to cope with a loved one’s addiction. Support groups can help family members to learn what they can and cannot do about a loved one’s addiction. Some of the best-known groups are Al-Anon and Adult Children of Alcoholics (ACoA). These support groups are based on the 12-step approach and work with the loved ones of those with addiction issues, both while the addicted person is actively using and also during and after treatment for alcohol addiction. Marriages can be seriously affected by a person’s alcohol addiction. The addicted person’s focus on his or her addiction makes it difficult to concentrate on a relationship with another person; many spouses try to handle their partner’s addiction to alcohol by attempting to control it in various ways. And in some cases, the couples may use or abuse alcohol together. While not every spouse of a person with an addiction is codependent, many are. Codependents Anonymous is one such support group that can enable spouses to learn how to work on themselves and their coping skills, regardless of whether the addicted person seeks treatment. Codependent people tend to deny their own needs, investing all their time in the addicted person. By enabling an addict through covering up for them or making excuses or other such rescuing behaviors, the codependent spouse actually reinforces the using behavior. This group teaches spouses how not to do this, and provides them alternative responses. Al-Anon is another support group that many partners of addicts and alcoholics have found helpful. Al-Anon members do not give advice, but share their stories with others. The group follows a 12-step model, in which helps members learn to let go of responsibility for their partner’s addiction. While they may not be as prevalent as support groups for spouses and general family, there are some support groups that hold meeting designed specifically for siblings. Siblings of an addicted person can be a neglected group in the treatment of a family dealing with a loved one’s addiction—in particular, when dealing with an addicted adolescent, the siblings often feel ignored when the parents are so focused on the child with the addiction issues.2 Siblings may find common ground and encouragement with others in the same situation through support groups. Al-Anon and Alateen both offer support group services to help young people—including those adolescent and teen siblings impacted by someone else’s drinking. In fact, Alateen is part of Al-Anon, but is specifically designed to help younger people who are coping with substance abuse in someone close to them, whether that individual is a parent, sibling, other relative, or friend. Treatment is needed not only for the addiction of the person who is using, but also for the whole family.Al-Anon’s support groups are also beneficial for the parents of children, both young and grown, who are addicted to alcohol. Parents are often faced with other stresses and challenges, including serious issues that go beyond their child’s alcohol abuse, such as any associated violence, illegal activities, comorbid psychiatric disorders, and risky sexual behaviors. Al-Anon can help provide support for these parents as members share their stories of learning to let go and stop enabling their children. Parents recount stories of following their children, bailing them out of legal situations, and trying to forbid them from associating with negative peers. Parents report feeling that Al-Anon gave them a place to discuss their problems with their children without feeling judged. One of the diagnostic criteria for addiction is listed as “recurrent (substance) use resulting in failure to fulfill major role obligations at work, school, or home.”4 And many addicted people do fail to fulfill their parental role, despite their efforts to manage their responsibilities. Parents’ inability to fulfill their parental role either physically or emotionally inevitably creates hardship for the child. Support groups for children can help them see that they are not alone in their struggle with their parent’s addiction. While support groups do exist for children, it is important to note that not just young children need support in coping with a parent’s addiction. Adult children need support in the face of parent’s alcoholism, too, whether it is a current addiction, or one that, years before, painfully impacted the adult’s childhood. Adult Children of Alcoholics (ACoA) is a well-known support group that helps adults work through their issues of having grown up with an addicted parent and learn how to cope with a parent who is currently addicted alcohol. The website for the group mentions the sense of shame and abandonment that many children experience when growing up in alcoholic families. Substance abuse profoundly impacts the family of a person with an alcohol addiction. Treatment is needed not only for the addiction of the person who is using, but also for the whole family. Finding the right support group for you is a valuable part of treatment for addiction and the family of the alcoholic. 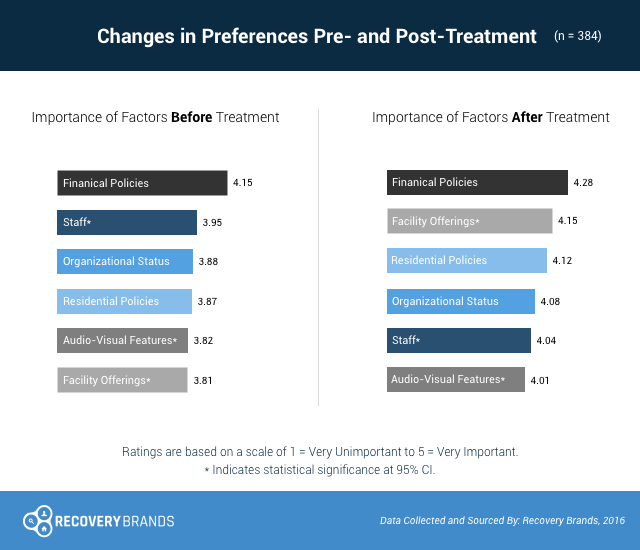 Recovery Brands collected data in 2016 asking people who were leaving a treatment program what facility attributes they believed to be as valuable things to consider when examining a treatment program. The most important consideration was the program’s monetary policies, for example payment options, financial support, and insurance accepted. They also appreciated the facility’s offerings (comforts, quality of food, room style) much more upon treatment completion. If you’re entering treatment, you may want to look at a treatment program’s financial practices as well as its offerings to assist you in your choice. If you or someone you love has an addiction to drugs or alcohol, call our helpline today to learn about treatment options which can start you or your loved one on the path to recovery, 1-888-287-0471	Who Answers? . Centers for Disease Control and Prevention. (2015). Health, United States, 2015. Center for Substance Abuse Treatment. (2004). Substance Abuse Treatment and Family Therapy. Rockville (MD): Substance Abuse and Mental Health Services Administration (US). Substance Abuse and Mental Health Services Administration. (2012). Data Spotlight: More than 7 million children live with a parent with alcohol problems.